Family and friends of Rob Wudlick are raising money to pay for uninsured medical expenses associated with catastrophic injury. 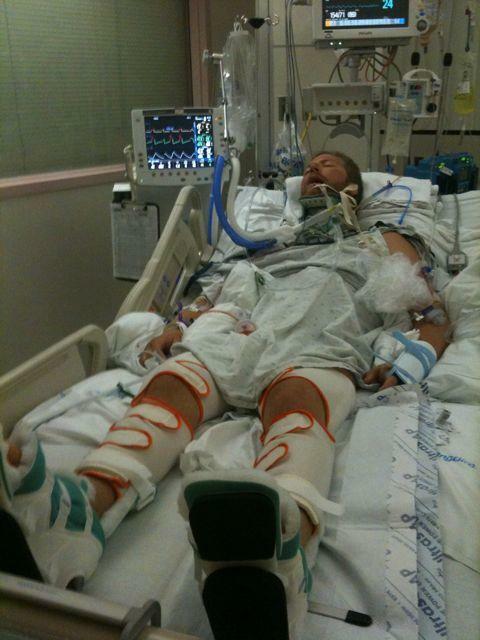 On April 4, 2011 Rob shattered his c4 and c5 vertebrae after he dove off a raft in the Grand Canyon and an eddy current jammed his head into the sand. With prompt and skillful medical attention, he is on his way to recovery. Currently he cannot control most of his movements below his shoulders, but he has sensation to varying degrees all over his body. Many people with spinal cord injuries continue to recover function below the level of injury for YEARS post injury. HOPE! Since Rob and his parents arrived back in Minnesota in early August 2011, he has been slowly regaining more and more muscle activity below his level of injury. With support, he can move his right arm in many different ways! His thumbs, abs, back muscles, quads, glutes and feet have shown signs of muscle activity developing. He has been busy with Physical and Occupational Therapy at the Courage Center. And a great resource has been the warm therapy pool at The Marsh, a local fitness center. With the funds raised through HelpHOPELive, this fall, Rob started the ABLE Program at the Courage Center. This has been a crucial part of regaining muscle strength and movement. ABLE stands for Activity Based Locomotor Excercise. Rob really works out during his 4 hour long sessions, 3-4 days a week. The therapists have him standing in harnesses, partially supporting his own weight, and walking with either manual assistance or with electrical stimulation! They work his abdominal muscles, which has improved Rob’s posture and balance. The days Rob is at ABLE are always good days! There has been real progress in movement through this therapy. It is a long haul though. We have also used HelpHOPELive funds to purchase an FES Bike (used) for home use, and a Standing Frame for home use. Future plans may include a trip to ProjectWalk in Southern California. The program there is even more aggressive than the ABLE Program and includes a whole-life approach to recovery. We are grateful for the opportunities Rob has been able to have which were funded by the generous contributions from friends and family. Thank you all! Rob has chosen to fundraise with HelpHOPELive because HelpHOPELive provides both tax-deductibility and fiscal accountability to contributors. Contributors can be sure that funds contributed will be used only to pay or reimburse medically-related expenses. To make a contribution to this fundraising campaign, select the “Donate Now” button or see the “Mailing a Check?” section of this page. It’s been a long haul for the Wudlick Family over the past 3.5 years, but they’re making it work! Thanks to the generous support from friends and family around the country. All of Rob’s perseverance and positive attitude has been paying off with continued good health and big improvements in regaining muscle movements below the level of his injury. Most notably his core muscles! Funds raised here will help him pursue the best treatment opportunity whenever and wherever it comes along. Things are looking promising for that happening pretty soon! Rob was born and raised in the Lake Minnetonka area, west of Minneapolis, MN. His parents, Bud and LuAnn, and his sister, Marta Snow, still live there. Rob loves Lake Minnetonka. He spent most of his summers on the Lake: Swimming at Sandy Beach, Lake Minnetonka Sailing School, party boat captain for Bayside, MYC race committee and facilities guy, and cruising around with good friends! He is a 2003 Minnetonka High School graduate, and a 2002 Troop 424 Eagle Scout. When it came time to head out to college, the mountains called him to Montana State University. 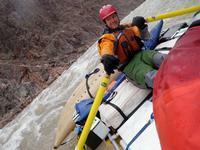 There he became an avid back-country skier, ice-climber, climber and raft guide. He just graduated this past December with a major in Industrial Engineering. His graduation celebration was the rafting trip of a lifetime: a month-long trip down the Grand Canyon with a group of 16 friends. 19 days into the back-country trip, on the afternoon of Monday April 4th, Rob took a shallow dive off a beached raft into the Colorado River. An eddy current twisted him around, rammed his head into the sandy bottom, and pulverized vertebrae C4 and C5 in his neck. His friends on the trip were all experienced outdoors people, some with wilderness first aid training, and they immediately responded. Apparently, Rob was immediately aware that he might have a spinal injury and made sure his friends immobilized him correctly, which they did. They also pulled him out of the water within 5 seconds! 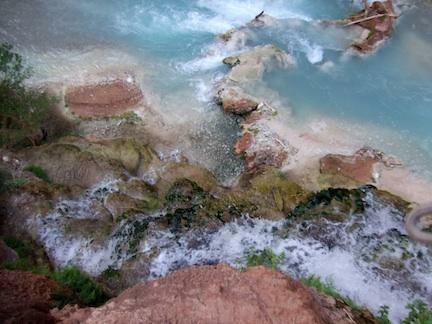 Five sets of vitals were taken before he was airlifted out of the bottom of the Grand Canyon by the National Park Service wilderness rescue helicopter. A medical rescue helicopter met them on the rim of the Canyon and brought him to the nearest Level One Trauma Center at the UMC in Las Vegas, NV. His family was contacted once he arrived in Las Vegas, which was at about 5:00pm Pacific/Mountain Time. Everyone responded immediately and expertly. They are all true lifesavers and we all will be forever grateful to them! What an amazing group of people. During the flight he was coherent and talking with the paramedics. Upon arrival in Las Vegas, it was determined that he was a good candidate for immediate surgery, since he had some tingling in his feet, although he was unable to move below his shoulders. The operation that night removed his C4 & C5 vertebrae, and replaced them with a titanium mesh “cage” filled with a slurry of Rob’s vertebrae, his own bone marrow and donor bone, leaving room for his Spinal Cord to heal. His parents and sister arrived in Las Vegas at 8:30am on Tuesday, April 5th on the earliest flight available, and have been at Rob’s side since then. (Well, Marta came back to Cottagewood after 3 weeks, but Bud and LuAnn have not been back to Minnesota since) The MRI shows that his Spinal Cord was NOT severed, but crushed. So there is HOPE for continued regaining of feeling and motion below his shoulders. After surgery, Rob was intubated through the mouth and put on a ventilator to help heal his surgery site in his neck. There is swelling associated with surgery anywhere, and since his was in his neck, the airway needed to be kept clear. Goal for the immediate recovery was to breathe on his own, for a day or two beginning the afternoon of Wednesday, April 6th, he could! This allowed him to finally talk! It was a long long day and night Tuesday when he couldn’t talk to ask all the questions he needed to have answered. Now he is working on strengthening the new group of muscles in his upper chest that he will need to use to control his breathing. It has been discovered that Rob’s left diaphragm is not working properly, which makes his breathing a continuing issue. He had to be re-intubated and weaned off the ventilator over the course of a month or so. Once he was healthy enough to undergo a tracheostomy to move the breathing tube into his neck, he was able to transfer to one of the best Spinal Cord Injury hospitals in the country, Craig Hospital in Denver, CO. Rob and LuAnn flew on a private medical transport jet from Las Vegas to Denver on April 22nd. Bud and Marta drove the distance overnight! Craig Hospital is a dedicated Spinal Cord Injury and Brain Trauma Rehabilitation Hospital. They provide a whole care treatment of the patient and family to allow everyone to live to their full potential in whatever condition they may end up. Rob is learning how to instruct people on how to care for him as well as doing physical and occupational therapy, learning about SCI, learning how to use technology to help him, as well as receiving high-quality specialized medical healthcare. One great technology is the FES bike that Rob uses 3 times a week. He rolls up to a stationary bike and electrodes are attached to his leg muscles. Trough mild electrical stimulation of specific muscles, Rob actually pedals the bike! This therapy helps keep those muscles from atrophying and improves circulation for better overall health. And it really boosts his mood! He can pedal about 5 miles in half an hour. Hopefully as his bruised Spinal Cord heals, he will be able to use the same technology on his arms. Rob’s wheelchair is a powerful electric chair that he can control with a “sip ‘n puff” straw mechanism. He is a fast learner and can maneuver through hallways, doors, sidewalks, buses, paths and even onto a pontoon boat! In the past few weeks he has been able to go on frequent field trips set up by the Recreational Therapy department. He has even gone fishing with a sip ‘n puff fishing pole that someone has developed. Rob really hopes to get his trache out so that he can go on the sailing and rafting trips. Rob has a long road of recovery ahead of him. Spinal Cord Injuries aren’t really considered healed for up to 2 years post-injury. Frequently people do continue regaining movement and feeling that far along. Hope! Right now, three months post-injury, Rob has regained much of his feeling all over his body and has some slight muscle contractions around his knees and elbows. Occasionally, he has been able to wiggle a big toe! He reports gaining a lot more control of his abdominal muscles, which helps with balance in his wheelchair. Beyond just not being able to use his arms or legs, he has issues with regulating his blood pressure, which makes him black-out easily when in an upright position. And, the breathing issue continues to plague him. The Spinal Cord regulates your autonomic system as well as your movements and sensations. Tentatively, Rob and his parents will return to their home (modified!) in Minnesota at the end of July. There Rob will continue with intensive physical therapy and get lots of hugs and kisses from his two young neices! He loves all the visits and phone calls and notes from friends all around the country. Keep them coming! Hey Rob, You look good on those oars. I believe we will boat together someday. Ahh...what to cook for you now?? ROB WUDLICK IS THE MAN!! !